I quite often get questions about whether growing your own fruit and veggies (or herbs for that matter) is truly cost effective. For many there is this presumption that growing your own must be expensive, labour intensive and requires a large amount of space. To be fair I am not the most 'green fingered' individual and with my limited gardening knowledge some things have been more successful than other. But I do believe you can make gardening as big or costly as you like. We started off small (on a suburban block) and have continued to develop both our garden and our knowledge- what works for us... and we could always use a little for space! There are plenty of great space saving solutions out here for those who want to grow, and many using recycled materials. As for the cost of plants; a few seedlings (particularly of the right plant) can produce its value in veggies 10-12 times over (maybe more). Or a cheaper option (though you need more patients) are seeds... and once your plants are mature, save the seeds and then you can continue for years to come for free! On the subject of free, I recently came across a Facebook post listing a number of foods you can grow from food scraps; the bits you don't eat, that we cut off and discard. Or generally in our house is fed to the animals (pigs, poultry, dogs) or occasionally may make it as far as the composter, given it's not over flowing with garden waste, old animal bedding and manure. So I decided to try a few of these. After all it's 'free food'. Why wouldn't I? So for each item I try, I intend to document the results... either way. 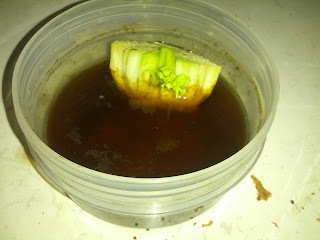 I have already documented how to regenerate roots from cut basil stalks, instead of harvesting directly off the plant. When I uploaded this blog, I did receive a comment that basil is easy to grow from seed. And I would have to agree, and mine self seeds wonderfully. But I was curious as to whether it could be done. And if I can regenerate more when ever I want to use some, I don't see why you wouldn't. Besides if it can be done from mine, it should be possible from fresh bunches purchased from a store/ supermarket. I currently have another bunch sprouting roots; this bunch is only 2 weeks old and the roots are far more developed than my last attempt- the difference being I have had them in a seaweed solution, not just fresh water. Due to the improved results I also used a diluted seaweed solution for this celery stalk, well half a celery stalk. This was a supermarket purchased a half bunch; once I cut it off to use the stalks to use I placed it by the kitchen window. This took place over the weekend; 4 days later, it's already begun to grow! So I will continue to update their progress, as I continue to experiment with how to generate 'free food', after all who doesn't like a free meal!